As esports dominates the world and attracts more and more gamers, many are reviewing the percentage of minorities the players are made up of. Diversity has always been an issue in many industries but it is increasingly becoming quite prominent in esports as it gains more attention. The online format allows abuse to be easily transferred and many minorities, such as women, gamers of colour and players from the LGBTQ community unfortunately stay clear of potential esports professions. AnyKey is an initiative which aims to break down these barriers to create an industry with diverse participation – and with their help we can see if esports really needs to clean up its act or better marketing strategies need to be incurred. A journalist at the 2017 Intel Extreme Masters press conference in Katowice questioned Intel’s director of developer relations, Lee Machen, on the viability of mixed tournaments in esports, suggesting women are known to be emotional and losing may not go down so well and therefore can’t compete against men. This question summarises the issues women face in all professional leagues of sport and instantly puts them on the outside. To combat this, among many other serious diversity issues in e-Sports, Intel and the Electronic Sports League teamed up to create an organisation which supports participation from all players, regardless of their gender, race, age, appearance, religious belief and background. Their current research is predominantly based on women in esports, but its expanding to cover all minority groups in the industry. The AnyKey initiative was launched in early 2016 with the main aim to make “gaming culture in which players are noted for their skills, not personal traits.” The team behind AnyKey consists of the Director of Initiatives, Morgan Romine, who was the former captain and co-founder of the all-women professional gaming team, the Frag Dolls; while the the esports Director for Firefall at Red 5 Studios. T.L. Taylor oversees the research division as a professor at MIT and author of Raising the Stakes: E-sports and the Professionalization of Computer Gaming. What makes AnyKey different is it is a research-orientated first organisation with academia resulting in the questions posed to the experts in the industry. Workshops are conducted to determine the best possible outcomes for esports in terms of diversity. 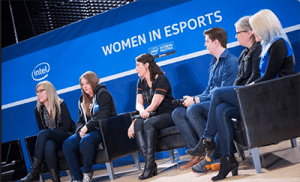 The first workshop for AnyKey involved researching challenges a select group of group of professional female esports players, hosts, streamers, and industry stakeholders have faced since entering the industry. Both gender stereotypes and harassment were indicated to be major challenges reported by the group, as well as the need for support, and males not realising the obstacles females face. Harassment was tackled due to the reported volume and frequency of comments which constitute abuse. While it is difficult to put a statistical number on harassment in esports, anecdotal evidence proves it is quite common. The workshop also found women often rely moderators to intervene but since there were so many comments, the task was deemed quite difficult. Many women reported they felt they couldn’t retaliate due to their career positions, and others even reported withdrawing due to the constant harassment. Strategies were brainstormed to combat these issues including gaining help from male allies to create behavioural normalities in an online sphere, codes of conduct at tournaments and conventions, and resources for players to call on when facing harassment. Director of Initiatives, Morgan Romine, said in an article to PC Gamer trash talk is the culture behind esports, but there needs to be a framework. As such, AnyKey has set up the Keystone Code which aims to encourage compassion, integrity, respect and courage in online communities as a place to start when it comes to learning how to behave. Another workshop in late 2016 focused on esports in colleges due to the increase in scholarships for students – akin to traditional sporting scholarships. It looked at the potential of college gaming as it allows for cross-gender, multiracial, and LGBTQ diversity due to the face-to-face settings. It also addressed how universities can provide tremendous possibilities for esports to grow and support diverse and inclusive participation. The workshop included 10 to 12 stakeholders and several themes were explored including the long documented engagement levels of women in esports, the importance of student-led clubs, the need for inclusion to be proactive, the requirement for welcoming spaces, the idea co-ed teams in college should be considered, and the concept of support for non-players after a career in esports in different areas. AnyKey is an interesting concept which will result in one thing being determined if just some of strategies listed above are implemented – whether it’s harassment which is preventing female players and other minorities from playing, or if esports simply appeals more so to white and Asian men which is suggested to be the dominating markets. A huge hurdle the organisation faces is the generalisation of inequality in esports. Not all players are racist, sexist, or abusive and to address the issues embedded deep in esports AnyKey needs to figure out a way around labelling all players this way or face backlash and ruin its research and goals. Despite this, Romine has said AnyKey first wants to provide support for players in need. Why is esports so popular in Korea?